A few weeks back, a news went viral that Google is quitting the satellite business. Google sold its satellite imaging business to Planet, which triggered a news that Google is quitting the satellite business. However, Google cannot quit the satellite communication business. In fact, they are planning the biggest satellite launch project ever along with SpaceX. The truth is that Google has just quit the satellite imaging business and not the satellite communication business. These are two totally different technologies with totally different applications. In fact, Google cannot quit the satellite communication business. Google is an Internet company and it is essential for its growth (if not survival) to provide faster Internet connections to more people around the world. That is one sure shot way, they can provide services to more people. So, Google continues to be very aggressive on this front. They continue to improve their Loon project, where the Internet is beamed using balloons. We produced a video explaining how Project Loon works. It is really awesome, you may check it here. 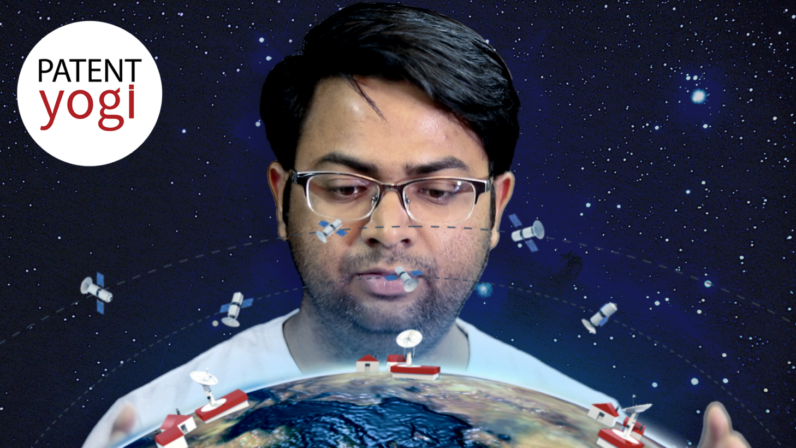 Recently, PatentYogi team discovered a patent application from Google, that discloses Google’s plans to create a satellite constellation to envelope entire globe. The satellite constellation will include over 4000 satellites. This is not a crazy, moonshot project that would be dropped. In fact, Google is implementing the project as we speak. Google does not have launch capability. Earlier last year, Google invested $1 billion in SpaceX for a 10% stake in the company. This makes sense as SpaceX has the capability to launch these 4000 satellites into orbit. Soon afterward, the inventor marked on the patent, Mark Krebs moved from Google to SpaceX. Then in November 2016, SpaceX filed an application with the Federal Communications Commission (FCC) to launch 4,425 satellites. The patent application reveals some interesting details about the satellite constellation. The constellation includes a first group of satellites orbiting at a first inclination angle. Further, the satellite includes a second group of satellites orbiting at a second inclination angle different from the first inclination angle. The first group of satellites orbits at an altitude higher than the second group of satellites. Therefore, the first group of satellites provides a larger coverage area. On the other hand, the second group of satellites provides a bigger system bandwidth and supporting an increased number of users. Another cool feature is that satellites provide overlapping ground coverage to avoid communication downtime when a satellite is experiencing problems. The satellites are arranged to provide at least 75% coverage of the earth at any given time. Any communication from a source ground station to a destination ground station is routed via one or more satellites. Now, we can ask how will ground stations provide internet connections to users. Well, Google has already figured out the answer. After investing in SpaceX, Google acquired a company called WebPass. WebPass specializes in providing point-to-point wireless high-speed Internet to customers. So the ground stations can directly beam the Internet to customers using WebPass. I am excited about this technology. Google has figured out the full process to deliver high speed, high availability and low-cost Internet to people across the world.